The Little Free Library at Fairfield and Ward Avenues in Bellevue. Photograph by Randy Simes for UrbanCincy. The City of Covington will join the City of Bellevue soon when Jeff Pelini installs a “Little Free Library” at the intersection of Sixth Street and Craig Street. The matter was approved by the Covington Commission at their January 7 hearing, and will allow for the miniature bookshelf to be installed along the street. These fixtures have become increasingly popular across the United States and throughout the world as the sharing economy continues to take hold. They are initially stocked with some books and anyone is welcome to take a book and return it or place another book inside for others to read. The Little Free Library to the east in Bellevue sits at the intersection of Fairfield Avenue and Ward Avenue just in front of the St. John United Church of Christ. It has been there for approximately three years. A new one was recently installed on Van Voast Avenue in Bellevue as well. In September the City of Bellevue approved a certification program to encourage community engagement through construction of the little free libraries. “The goals of the program are to promote literacy in the city, improve neighborhood aesthetic and community. Little Free Libraries also indirectly increase pedestrian activity which promotes safety,” Ryan Salzman of the Bellevue Alliance told UrbanCincy. In 2009, villagers in Somerset, England transformed one of their iconic red telephone booths into the country’s smallest library. The idea for this concept first gained publicity in the United States during the Occupy Wall Street movement in 2011 when camps of protestors began creating a temporary community, including what they called The People’s Library. Then, in 2012, John Locke gained notoriety for his DIY libraries in New York City. 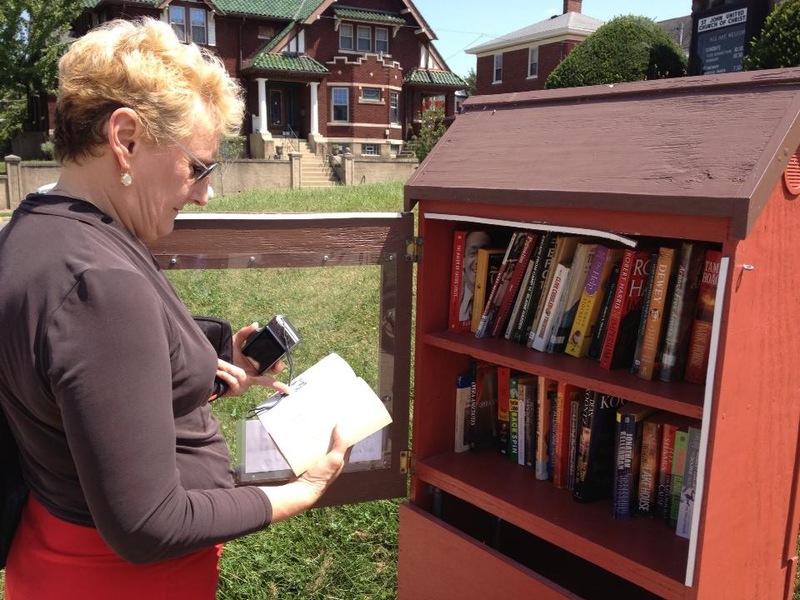 According to Little Free Library’s mapping system, there are 18 of these stands throughout the Cincinnati region today. The Covington location will be the second in Northern Kentucky.